As visitors took off in the Mekong Delta, the remarkable small province of Ben Tre was always one ferry beyond the tourist traffic of My Tho and consequently developed at a more languid pace, though the opening of the Rach Mieu Bridge from My Tho funneled more travellers into the area. The town’s sleepy waterfront, with ageing villas, is easy to explore on foot, as is the rustic settlement across the bridge to the south of the centre. This is also a good place to take boat trips in the area, especially for those wanting to escape the tour bus bustle. 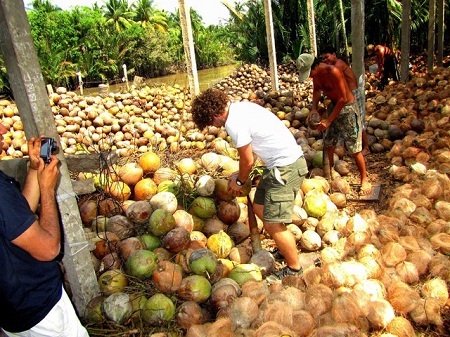 Ben Tre is known for its keo dua (coconut candy). Many local women work in small factories which make these sweets, spending their days boiling cauldrons of the sticky coconut goo before rolling it out and slicing sections off into squares. (Bao Tang Ben Tre; Ð Hung Vuong; 8-11am & 1-5pm) This museum is located in an ageing but atmospheric old yellow villa, displaying the usual assortment of rusty weapons, American War photos and artefacts yielded from archaeological digs. (075-382 9618; www.bentretourist.vn; 65 Ð Dong Khoi; 7-11am & 1-5pm) Tourists can rent bike, motorboat and speedboat ; also arranges excursions and tours. (075-382 2408; 166 Ð Hung Vuong; d/tw/ste 350,000/370,000/530,000d) Good-value Hung Vuong has an attractive riverfront location, plus large tidy rooms with tiled floors, polished wooden furnishings and decent bathrooms. (http://bentrehoteloasis.com; 151C My An C, My Thanh An; d US$27-35, f US$42) It’s an popular, bright yellow and small hotel with warm welcome, which is run by an affable and very helpful couple. It’s south of the river and best reached by taxi. (075-356 0560; www.hamluongtourist.com.vn; 200 Ð Hùng Vương; đ US$23-29, ste US$43) This hotel is large, modern with big, starkly decorated corridors, but the rooms of this hotel are beautifully furnished and there’s a swimming pool and gym. For ultra-cheap eats, head to the market, where plenty of food stalls (dishes around 15,000d) await. Ham Luong’s rooftop cafe is ideal for having a drink or an ice cream. (075-382 2873; 40 Ð Phan Ngoc Tong; mains 20,000-60,000d) Centrally located, this place attracts a lively local crowd thanks to its popular grilled chicken, which is best washed down with draught beer. There are buses which stop at the big bus station (Ben Xe Ben Tre, Hwy 60), 5km northwest of the town centre (30,000d by xe om). Places include HCMC (67,000d), Can Tho (55,000d), Ca Mau (103,000d) and Ha Tien (134,000d). There are last buses to Hochiminh city which leave between 4pm and 5pm. You can rent slow boats at the public pier next to the market. Figure on roughly 70,000d to 90,000d each hour, with a minimum of two hours cruising the local canals.